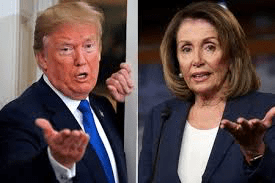 The House Democratic Speaker seems to be trying to throw Donald Trump a bone b y saying he COULD help get a comprehensive immigration reform bill…. If he was to do so? He’d have to jettison his trusty anti-immigration Assistant Stephen Miller…. And go with his son-in-law Jared Kushner…. THAT would be leaving the anti-immigration people standing alone…. Could Trump actually dos this? He’d surely be twisting his party like a pretzel…. Pelosi has already had him Dom that, eh? Speaker Nancy Pelosi (D-Calif.) said Thursday that comprehensive immigration reform is “inevitable,” and left open the possibility that it may still be possible under President Trump. Pelosi noted that Democrats secured new funds for immigration judges and other border measures in the spending bill that ultimately reopened the government, which Trump signed in February. But she accused the president of failing to tap those funds for their intended purpose. “He has not utilized what is in that, specifically, [for] the border,” she said. Pelosi also warned that the only long-term solution to the border crisis is the adoption of comprehensive immigration reform package, like the bipartisan bill passed by the Senate in 2013. House Democrats have not introduced such a bill this year, pushing instead for piece-meal immigration reforms that include new protections for so-called “Dreamers” and those under temporary protected status. And Republican leaders in the GOP-controlled Senate have shown little interest in moving on a comprehensive immigration reform bill, instead joining Trump in urging more funding for the border wall as a first order of business. “Our country is full,” he tweeted over the weekend. There was a bi-partisan immigration deal, co-sponsored by John McCain, Lindsey Graham and other Republicans in Congress, that was shot down by (non-Cong.) Stephen Miller and the anti-immigration lobby. Similarly, after bi-partisan round table at the White House, it appeared that the President would go along with a deal, until various forces inside and outside Washington (Miller, Fox News, etc.) shot it down a day or two later.